Smartwatches and ar glasses may be among the most popular gadgets as far as wearable devices are concerned, but two nail art enthusiasts are making wearable tech far more fashionable by incorporating unique digital sensors into the designs they create for finger nails. The nail designs are not only attractive they serve a practical function. The creators behind the project are Jenny Rodenhouse and Kristina Ortega. They believe that nail beds could be the ideal spot for digital sensors that could enable people to track their movements. It may also benefit users in other ways. For instance, if someone wanted to give up smoking, the sensors could remind them not to engage in certain actions, such as lighting a cigarette. One of the biggest problems the wearables industry faces is that many of the gadgets, such as Google Glass, are not attractive and do not look “cool”. If this technology is to really be successful, it needs to be accepted by the average person and not just individuals who are interested in tech. 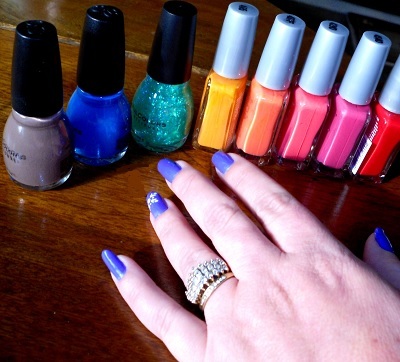 Manicures are big business in the U.S. and, presently, women across the nation are not just having their nails painted, they are having designs put on their nails that include decorative objects like rhinestones, hoops, studs and even 3D printed objects. The wearable tech nail designs could offer many benefits. One of the chief benefits of focusing this technology on nails is that many people like having their nails done and they like to wear long nails despite how impractical they may be. Furthermore, unlike other wearable devices, enhanced nail art would require maintenance and regular trips to the salon for updates. Depending on the kind of sensor that is used, Ortega and Rodenhouse hope that programmers or doctors and nail technicians will be available to assist people in perfecting their data. Since the wearable tech sensors are being designed to accommodate coding for particular behaviors, they can be programmed to suit the wearer. For instance, one person may want to have an LED light come on to remind them to take their medication, while another may want the sensor that reminds them not to smoke.